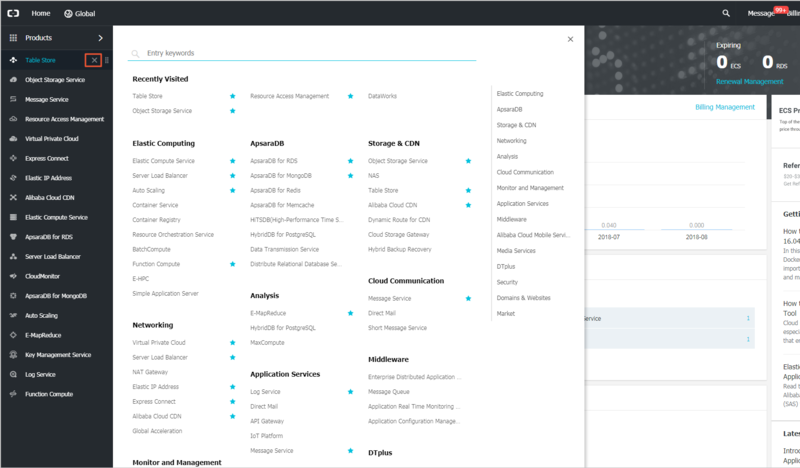 The Alibaba Cloud console is a web application used to manage Alibaba Cloud products. It provides an intuitive user interface that allows you to start and connect to ECS instances, use OSS buckets, and set alarm rules. You can access the console of each product or service through the Alibaba Cloud console or the product details page. The console also provides information about your account and billing. You can access products and services through the console. View frequently used products and services on the left-side navigation pane of the Alibaba Cloud console. 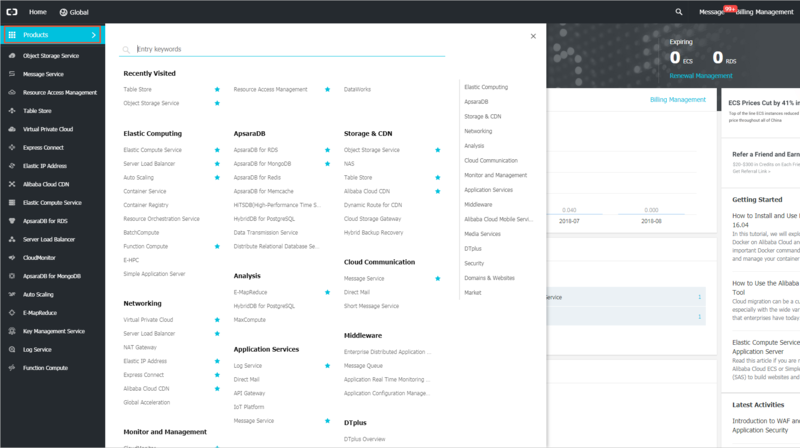 Click Products on the left-side navigation pane of the Alibaba Cloud console to open the complete list of products and services. Click the name of a product or service to open the console of the product or service. You can add shortcuts of frequently used products or services to the console or delete existing shortcuts. Click the corresponding icon of any products or services to add them into the frequently used products and services list. Click the corresponding icon of any products or services to remove them from the frequently used products and services list. You can use the console to change the password of your Alibaba Cloud account. On the top navigation bar of the Alibaba Cloud console, click your account. On the Security Settings page, click Change next to Logon Password. On the Identity Verification page, choose a verification method. If you want to verify your account by phone, go to step 4. If you want to verify your account by email, go to step 5. Verify the account by phone. In the Verification codebox, enter the 6-digit verification code you received, and then click Submit. Enter your current login password, new login password, and the new password again for confirmation. Then click OK.
Verify the account by email. Click Choose another verification method. In the Verify by Email area, click Verify. In the Verification code box, enter the 6-digit verification code you received, and then click Submit. Enter the current logon password, new password, and new password again for confirmation. Then click OK.
You can use the console to get billing information of your Alibaba Cloud account. On the top navigation bar of the Alibaba Cloud console, click Billing Management. On the Billing Managementpage, you can view your spending summary, bills, usage records, orders, and coupons. You can use the console to set message recipients and their receipt methods. On the top navigation bar of the Alibaba Cloud console, click Message . On the Message Center page, select Message Settings > Common Message Settings. The system lists notification types, and their receipt methods and contacts. Modify the receipt methods such as email and text message, for each type of messages. The default message recipient is the account contact. You can click Modifyto add or delete other message recipients. ICP Filing is the action of submitting a document to the competent authority for storage and further query. According to the Regulation on Internet Information Service of the People’s Republic of China, applicants must apply for an ICP Filing for their Internet information services within Mainland China. You can apply for an ICP Filing service number through Alibaba Cloud console. Click ICP on the top navigation bar of the Alibaba Cloud console. For more information about ICP Filing, see ICP Filing documentation. 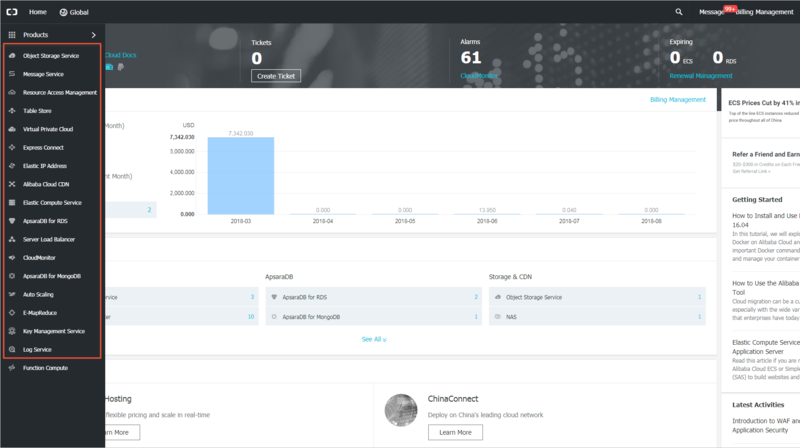 The console provides portals for various help resources, including the product documentation and Alibaba Cloud developer forum. Select More > Documentation on the top navigation bar of the Alibaba Cloud console. On the console, you can use the ticket system to open a ticket about consultation and technical issues. After receiving the ticket, Alibaba Cloud technical representatives will answer your questions on immediate basis. From the top navigation bar of the Alibaba Cloud console, select Support > Open a new ticket. On the Open Ticket page, you can select either a consulting or technical issue. Then click Ask. Select an issue type and the case severity (critical or low), describe the case, enter your email address, and click Submit. After opening a ticket, you can view the ticket handling progress in My Tickets. Note Alibaba Cloud reviews the ticket priority you set. If the ticket is confirmed as emergency, Alibaba Cloud will handle the issue within two hours. We recommend that you use IE9.0+, Chrome 53+, and firefox50+ to visit Alibaba Cloud official website. If you use earlier browser versions, the browser may fail to load some pages of the console.